Is Teeth-Grinding Damaging Your Smile? Grinding your teeth is an unconscious habit for many people. It can happen because of stress and a clenched jaw. It can happen because of an improperly aligned bite. It usually happens while you are sleeping at night. Whatever the reason of habitual teeth-grinding (a condition also known as bruxism), it can cause damage to your smile. Bruxism can increase your risks of tooth breakage, tooth decay, and TMJ disorder. 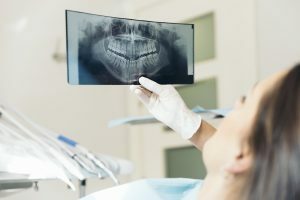 If you live in or near Sheridan, WY, and believe that you are grinding your teeth, it is important to talk to your dentist at Grinnell Street Dental. Each of your teeth has an outer shell of enamel, which is one of the hardest substances in the human body. While enamel is durable enough to withstand chewing food multiple times a day, it is not durable enough to withstand grinding against an equally hard surface. Over time, teeth-grinding can create microscopic fractures in the surfaces of your teeth. These fractures can make your teeth feel sensitive to extreme temperatures. Even the tiniest of fractures can weaken your teeth and leave them vulnerable to larger breaks and fractures. Microscopic fractures in the surface of your teeth may not be visible to you, but they can make very attractive homes for harmful bacteria. Bacteria can collect inside of the tiny cracks created by grinding. Bacteria hiding in the surface of the teeth can be harder to remove with your brushing and flossing routine. Buildup of harmful bacteria can cause erosion of the enamel that can lead to cavities and more advanced forms of tooth decay. Your temporomandibular joints (TMJ) are the joints on either side of your jaw that control your mouth’s movement. Grinding your teeth and clenching your jaw can put excessive strain on these joints. This strain can eventually lead to TMJ disorder, which can lead to pain and dysfunction of your jaw. Grinding your teeth can create problems for your smile. Schedule a consultation by calling Grinnell Street Dental in Sheridan, WY, at (307) 672-7567. We also proudly serve the residents of Gillette, Billings, Miles City, and all surrounding communities.